Who/What is Enterprise Management Associates? Who Should Care About a CMDB System? Ok, So Are the Odds Really Against You? Chapter 5: IT in Transformation: What's Going On and Where Does That Leave the CMDB? How Has the Model for IT Changed? What Does It Mean for IT to “Show Value”? Is ITIL Enjoying a Rebirth as Another “New Trend”? Given All This, and More, Are CMDB Systems a Reemerging or an Aging Trend? What's Most Popular? What's Most Successful? Whom Should You Talk To and What Should You Ask Them? 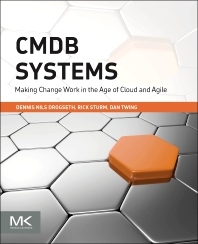 Chapter 15: The CMDB System Moves to Cloud and Beyond! Appendix C: Self-Assessment: What If You're Not Ready? Don't Think You're Ready, But Want to Set the Stage? Dennis Drogseth is Vice President/Research IT Megatrends, Analytics and CMDB Systems at Enterprise Management Associates (EMA), which provides market research and advisory services to software companies and IT executives. Dennis spent 14 years with IBM in marketing and communications, including a year of international consulting, and also worked to develop marketing strategies and new business models for Cabletron’s SPECTRUM management software. Rick Sturm, MBA, has over 30 years of experience in the computer industry. He is CEO of Enterprise Management Associates (EMA), a leading industry analyst firm that provides strategic and tactical advice on the issues of managing and securing computing and communications environments. EMA is a leading industry analyst firm that provides strategic and tactical advice to major corporations and government agencies on the issues of managing computing and communications environments and the delivery of those services. He was co-chair of the IETF Applications MIB Working Group that developed the standards for managing application software with SNMP. Rick has authored hundreds articles about various aspects of enterprise management that have appeared in leading trade publications in the US, Europe and Asia. He has also co-authored four books: The Foundations of Application Management, Foundations of Service Level Management, SLM Solutions: A Buyer’s Guide, and Working with Unicenter TNG. Founder and CEO, Enterprise Management Associates, Inc.
Dan Twing is President and Chief Operating Officer of Enterprise Management Associates. Dan is responsible for developing and executing strategic market research as well as directing product development and marketing efforts. Dan has over twenty years of experience in information systems, software development and technology outsourcing. Prior to joining EMA, Dan was the President & CEO of NETdelivery, a developer of secure electronic data collection, delivery and management software. Dan’s also served as Vice President of Financial Products for the Electronic Commerce division of EDS.